The Constitution was written to limit government power, but those limits are meaningless unless judges restrain public officials when they overstep their bounds. Judicial engagement is a cutting-edge approach to judicial review that ensures that Americans receive an honest, reasoned explanation in court whenever they allege a plausible abuse of government power. 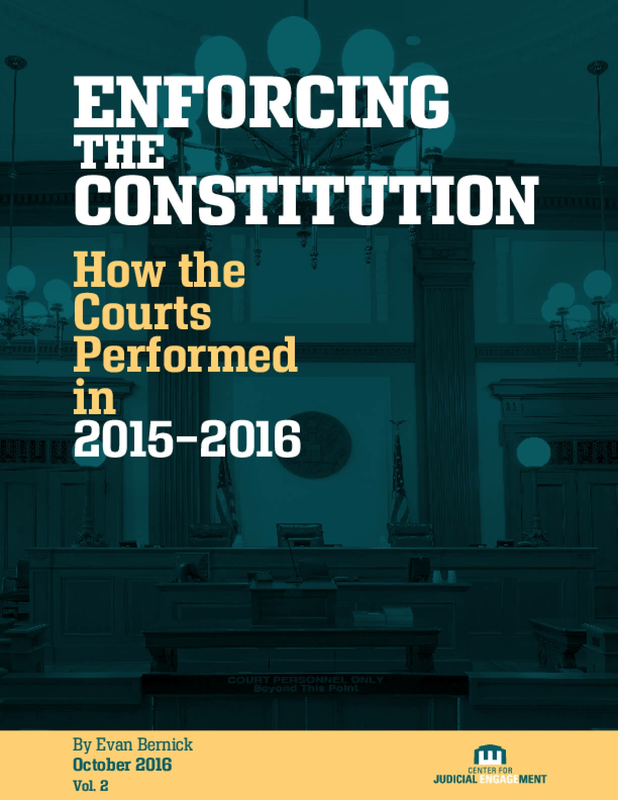 Enforcing the Constitution is CJE's annual review of the judiciary's performance. The 2015-2016 edition summarizes and analyzes 20 notable examples of judicial engagement and judicial abdication in a variety of contexts. We begin close to home, with a family out for a summer walk. We end in a place where most do not expect to find themselves - prison. In all of these contexts, Americans are confronted by government power; in all of these contexts, judicial engagement maintains the rule of law and protects our freedom. Fulfilling the Constitution's promise of liberty requires judicial engagement. This report explores the judiciary's performance in 2015-1016. Copyright 2017 by Institute for Justice's Center for Judicial Engagement. All rights reserved.